You mean I can knit anything now? And in this section of the yarn museum we have the live installation by the visiting 5’11” granddaughter of an art dealer, illuminating the perception of the fleet- ing moment. Of which there were not, however, a boatload. Title: Long Drink of Water. A full-size Bugatti made out of Legos. No glue. Holds two. It actually runs. Frankly, in the last picture, where they’re shown side-by-side, the Lego one is a lot cooler looking; they need to paint the real one to look like that if they want to have a really hot car. Of course this means instant inspiration and aspiration on the part of the Lego enthusiasts among the grandkids that they won’t outgrow any more than the folks who built this did. Talk about a dream job. Trying to do my usual treadmill time for a few days after last Thursday’s fall made it increasingly clear that there was some damage that had to be looked at. I got two tentative steps in last night and went, Nope. (Hopping off.) Too soon. I set the thing to 1.7 mph tonight and took the tiniest, quickest little baby steps, desperate for more than the doctor’s “take it easy” and to get at least some kind of exercise while that bone’s healing. I was even fine till about five minutes in. I kept going for another two because I’m kind of stupid like that. p.s. 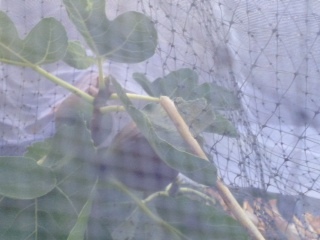 The fig needed one more day, so I let it have it. Tomorrow! It is a wonderful thing to walk outside first thing in the morning, find a fig drooping from the weight of the sugar and juiciness it attained to bird-free and to bring it inside to share. There was one yesterday, too, and there will be another tomorrow. Also yesterday: my new doctor said he didn’t think anything was broken because I didn’t react strongly enough to his prodding around for the sore spot. I told him that one thing he needed to know about me was that my ability to feel pain is diminished (which…can be nice…) and that’s why having this hurt like it does when I move the wrong way was a surprise. He gave me a prescription for a few nights’ worth of Lidocaine patches, not enough to get me through till I see him again next week but I figured I’d gone three nights with this already on my own, so no big deal. He assured me they did not cross-react with the categories of painkillers I’m allergic to. I’d never used them before. I put the first one on right before bed. I woke up amazed at how much of a difference a good night’s sleep makes. I’m looking forward to that next fig in the morning. I tried to drive Richard to work, made it one block, bailed and turned around and he later left work early to take me in. Passengering, it turned out, ie getting to sit still, was much easier. I flashed back to the pediatrician telling us it was going to take a year for our child’s damaged muscles to heal, and it did, and the idea of that vs. a broken rib healing in six weeks or so? Yes, definitely I’d like to know which one I was in for while it hurts to cough or breathe deep. My doctor retired a few weeks ago and I got assigned to the new guy and life gave me a chance to–or rather, demanded that I–scope him out to see what I thought. Young, Asian, tall, hipster with a man bun and an easygoing manner and a quick sense of humor. Okay, I think he’ll do just fine. I’m not an uncomplicated patient medically, but he struck me as someone who, if he didn’t know would happily go and find out. He went over the list of painkillers I can’t take and assured me that my history of liver lesions from the Crohn’s should not stop me from taking Tylenol. “You gotta quit falling.” A good-natured, half-pleading, fully-understanding statement. “Working on that,” I grinned. Yesterday I mentioned to Richard that I’d been thinking I ought to call my childhood friend Karen. I just really needed to. It had been awhile. Right then happened to be when I was on my way out to pick up the drycleaning and groceries but I wanted to remember to do it. I almost just stopped right there, and wondered why on earth I wasn’t, but it turned out later worked out better anyway. She happened to be celebrating our mutual friend Kathleen’s birthday with her when that phone rang. We three have been close since high school and I make a point of seeing them any time I’m back East. They live about 45 minutes apart. Kathleen needed someone celebrating her right now. They just didn’t quite know how to pick up the phone and cheerfully convey the news that hey, guess what, Bob cheated and we split and how was your day? Kathleen needed me to know, and I think she needed to be with the close friend when the far-away one mourned what was by now old hat to both of them but no less intense a source of pain. The virtual hug and the real one came together in those moments. I had no way to know. I’m so glad Richard remembered to remind me to call. 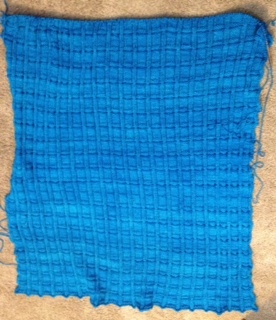 There’s a knit two rows purl two rows knit two rows sequence between the squares. 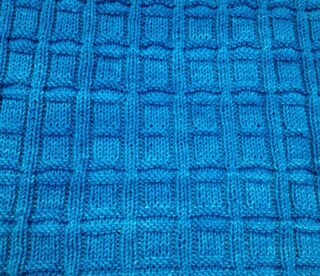 When I picked the blanket up again after not working on it for a week while we had company, I somehow only did the first two rows of that sequence of six. I did not see it till I was more than that much further along. 2. 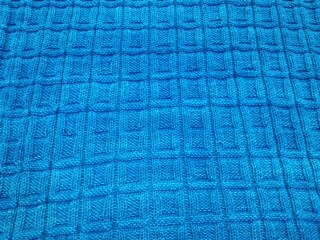 Cut it just above the spot, carefully undo enough rows to have plenty of yarn to be able to cast off right there (and where you would want that to be in the pattern), rip out the eighteen hours’ worth of wasted work and have a do-over at the top. 3. Cut it and do all that but flip it over and kitchener (ie graft) the now-live stitches from the top of the bottom to the bottom of the top (only 210 stitches, who’s counting) after I finish those balls and ignore that the stitches will be suddenly upside down to the rest of the blanket. Like nobody will ever know. 4. Which brings us back to, well then hey, ignore it without all that extra work. But if I just leave it It. Will. Bug. Me. 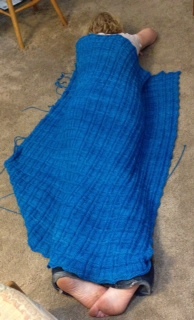 I think reknitting every one of those inches will be dependent on the baby hopefully refusing to be too much of a preemie, but it’s what I should do. 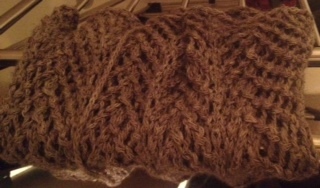 Like any kind of ribbing, it’s a slow-going pattern. 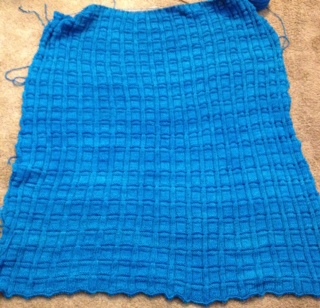 Although I think I’d make a plain wide border all around the shorter piece I’m going to cut off. One can only do so much. Now, who has a full bag of Rios in Cian in stock in a lighter shade than some and with no green in it that I can buy? The horse galloped for eighteen more hours’ worth of work (five hours ago) before I saw it . There’s some construction going on next to my husband’s commute with a lot of digging and we found ourselves going over a set of steel plates set on the road across from all that. Well, okay, there’s a utility-undergrounding project going on on that road but why the half-mile gap? The plates were a bit wet last week. Our water table is high enough that you can’t build basements, and I figured it was just displaced water from the construction work. Although, this was at a high enough elevation that it surprised me that it would happen there. Then there was standing water. Then there was an actual, splashing puddle this week, and he was Not Happy about driving over those plates and wondered why the city hadn’t gotten on this pronto. The things you learn after being married 38 years…. Turns out that when he was a teen, growing up in a house that was about halfway down a steep hill, there was a water leak next to the road at the bottom there. A crew came out to try to patch it but they couldn’t find the source and while they looked, the amount steadily increased. Not good. They had the road blocked off to traffic, but finally had to ask the neighbors to move their cars off the street altogether so they could test further up. So Richard U-turned the family cars and got them out of the way–this after having run various errands and having parked in front of the house a few times. The guy jammed some kind of pole through the roadway to test what was underneath. There was no longer anything underneath. Where my in-laws’ cars had just been, there was nothing but a huge cavernous sinkhole below the roadbed starting at the upper edge of their property, going the width of the street, about twelve feet deep, and thirty or forty feet long and he got to see just exactly how close he’d just come. He definitely did not want to be driving over those steel plates. Yesterday and today there were men standing in the hole he’d been sure was being created there. The men’s heads in that pit were at street level and it took up two and a half lanes of traffic (no bike lane for you!) with several flag men to keep people from driving into the abyss or each other as westbound diverted into eastbound. A little water is like a little kindness: it can quietly move that stubborn mountain out of the way all by its little self. In early July, Verizon downgraded the governmental-user data plan subscribed to by my county’s fire department and started throttling their data. They told them they had to upgrade to the 39.99 plan. The county fire chief did so. Then the biggest fire in California history got going. The thousands of firefighters from all over were coordinating teams, keeping tabs on where all those edges of the fire were going and on each other, when Verizon–again throttled the data. The same person who’d told our fire chief he had to upgrade to 39.99 was telling him about two weeks later that oh no, now it’s 99.99 for what you want. The fire chief who was in the middle of battling to save lives and homes while trying not to lose any of his firefighters and suddenly found himself flying blind. He begged them to lift the throttling. Their real-time information-sharing was almost completely killed. All to extort $60 out of a major public safety crisis. It’ll be interesting to hear how many other fire departments had the same thing happening to them just then. I’m sure we’ll soon find out. Huh. It worked this time. Those clay flower pots seem to have done their job. This was green yesterday. Another ten hours of ripening and I’m looking forward to picking this for breakfast. (While trying not to hope too hard.) Really, I should leave it a day past that but we’ve seen how that works out. 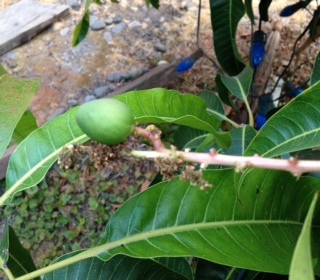 Meantime, twice today a squirrel took a sniff in the direction of the mango tree and then a step or two towards the side of it where the new mangoes are growing; up till now, they’ve taken a comically wide swing around to avoid the smell of the tree. The latex in the sap, I’ve been told. But this was something different and it looked like maybe it could eat those and it wanted to know. Cinnamon and foot stomping and at least this tree I can see from the front of the house. I have another large white netting cover ready. It cinches at the bottom. I’m just not sure yet that works with the Christmas lights. Afton (should I say Other Afton, or Local Afton) told me last week she’s about to move to Denver. 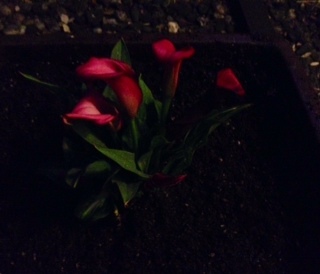 Ran to Trader Joe’s this evening, where they had small pots of flowering plants out front; I did a quick visual skim so I could keep going and ignore them–but that darkest-pink-to-purple calla lily jumped up and down and refused to let me not pay attention to it. I’d been looking for it for a long time without quite knowing what I was looking for–and with my sun sensitivity, it’s hard to go browsing at nurseries. I’ve had a large chestnut-brown ceramic pot near the front door ever since my friend Sheryl gave me several when she moved. Two have long been used. The third was very heavy, and when we found it had a crack in it it seemed like an announcement of, well that’s where that goes, then, and it’s a good thing that’s a good spot because even empty it was too heavy to safely move it again and it was far too nice to just toss it because of that. I just never came across anything that felt like the right thing to put in it. It seemed kind of dumb to have this big empty gorgeous pot just sitting there, and it was, but if I was going to put the effort into keeping anything alive it needed to be something that constantly drew me to it. It was pretty dark by the time I dragged the bag of soil from the back yard and got this all tucked away in its rightful new place, where it will bloom and the bulb will spread out to fill the space for years to come. I’d been waiting for it for a long time.